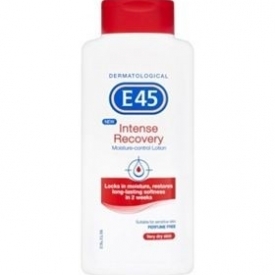 New E45 Intense Recovery Moisture Control body lotion is specially formulated to help support your skin’s natural moisture recovery and helps restore long-lasting softness in just 2 weeks. As skin gets drier, it looks and feels less healthy, and its ability to effectively retain moisture is weakened – a vicious circle that can leave skin even drier. 3. helps restore and maintain skin’s moisture level. The gentle, perfume-free formulation is non-greasy and quickly absorbed and can be used even on sensitive skin. Another of the many things I have stocked in my house for emergencies, this has been a life saver for the whole family when we have had moments of sore skin, dry skin and allergic reactions. Easy to apply, it absorbs really well and leaves skin looking more healthier. Great for flare ups or allergic reactions as it calms and soothes the skin. 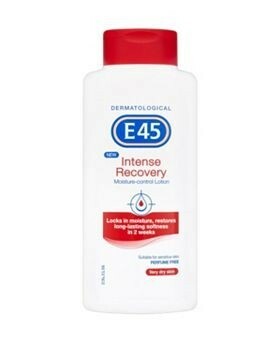 Can never go wrong with E45. This cream is great,my daufghter tried it because she suffers from eczema and it was easy to apply and soaked into skin effectively. After a few days use she commented on how good her skin was feelinmg. I used a little on my feet because they were feeling really dry and it left them really soft and feeling nourished.